Finding of the True Cross, by Agnolo Gaddi (1350-96). Basilica di Santa Croce, Florence, Italy. 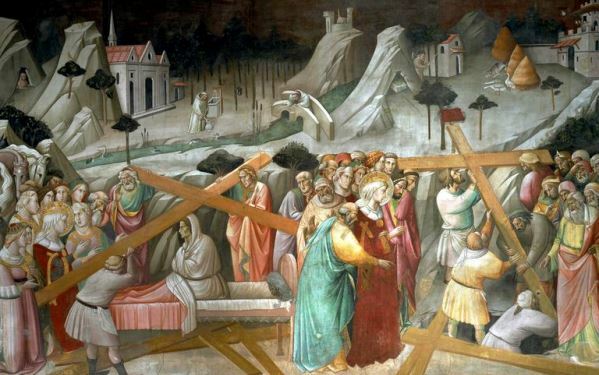 The feast of the Exaltation of the Holy Cross originated in the Church in Jerusalem. From the middle of the fourth century it was celebrated on 13 September, the anniversary of the dedication of the basilica erected on Golgotha under Constantine. According to the account written by a fourth-century pilgrim named Egeria, a relic of our Lord’s Cross had been found on that date a few years earlier. The “exaltation” or “raising up” of the Cross took place on the second day of the octave of the dedication; on that day, according to a liturgical book of the time, the venerable Cross is solemnly shown to all the Christian people. At the present time the most characteristic rite of this feast in the Byzantine liturgy is the priest raising the Cross above all the people’s heads, blessing them and turning to the four points of the compass, while the choir intones the Kyrie Eleison a hundred times at each point. Afterwards the faithful come forward to venerate the Cross and to receive one of the flowers decorating the place where the Cross has lain. In the Eastern Churches this feast is so important that it is considered an Autumn Easter. In Rome, from the beginning of the sixth century, 3 May was commemorated in the Vatican Basilica as a parallel feast, the Finding of the Holy Cross. 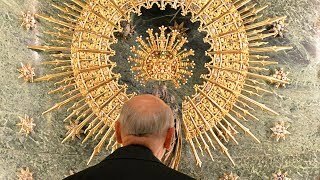 In the middle of the seventh century the Vatican Basilica adopted the Jerusalem custom of venerating a fragment of the relic of the Cross (called the lignum crucis) on 14 September. Pope Sergius (687-701) transferred the custom to the Lateran Basilica, giving it extra solemnity, such that by the eighth century the feast had spread all over the Christian West. Roman Missal, Preface of the Holy Cross. Christ is Passing By, no. 183. Pope Francis, Encyclical Laudato Si’, 24 May 2015, no. 227.